Willis Tower is the heart of downtown Chicago and the future of work and play. The 110-story building is one of the tallest buildings in the world and the second tallest building in Chicago, making it impossible to miss when appreciating the city’s skyline. The magnitude of this magnificent steel frame skyscraper can seem incomprehensible. Take a look at these facts and figures and we guarantee you won’t look at America's tallest building the same way again. 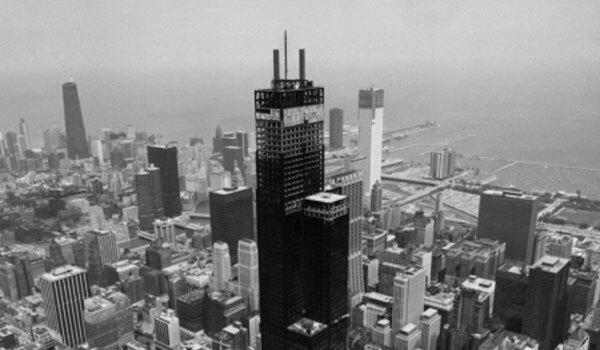 The original vision for Willis Tower came to life in 1969 when Sears Roebuck and Company decided it needed a central office space for its 350,000 employees. Willis Tower’s was designed by architectural firm Skidmore, Owings and Merrill. After breaking ground in 1970, it took three years to complete the tower. 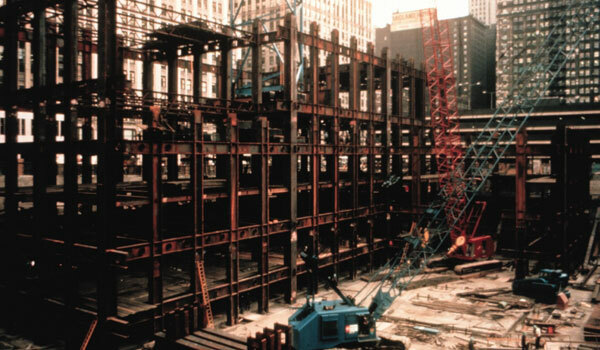 2,000 construction workers took part in building Willis Tower. The building features a steel-framed bundled-tube construction method. Construction was completed in May 1973. Willis Tower was the world’s tallest building until 1998. After 18 years, Sears Roebuck and Company sold the tower and moved out of the building. In 2009 the building was renamed Willis Tower after the Willis Group Holdings, the global insurance broker who calls the Tower its Midwest home. Willis Tower was purchased by Blackstone in 2015 for $1.3 billion. Skydeck opened in 1974 and attracts more than 1.7 million visitors annually. In July 2009, U.S. Equities Realty led the design and construction of a multi-million-dollar renovation of Skydeck Chicago. With the renovation of Skydeck came The Ledge, a series of windows that extend from the building offering views straight down over the city of Chicago. Inspiration for The Ledge came from hundreds of forehead prints left behind on the Skydeck windows each week as seen in the memorable scene from Ferris Bueller’s Day off. The ledge is 1,353 feet and 103 stories up. Skydeck is the highest observation deck in the United States. The Ledge is made of three layers of half-inch thick glass laminated into one seamless unit. The Ledge is built to withstand four tons of pressure and can hold 10,000 lbs. Each Ledge box has “heat tracing” to melt snow off. The boxes retract into the building for easy cleaning and maintenance. On a clear day, views can span 50 miles and four states: Illinois, Indiana, Wisconsin and Michigan. Guests can enjoy interactive and educational attractions that highlight the iconic building and celebrate Chicago’s sports, architecture, history, food, music and people. Willis Tower is owned by Blackstone and managed by EQ Office. The tower is home to more than 100 businesses including law, insurance, transportation, financial companies and more. Radio and television stations are broadcast from Willis Tower’s rooftop. 15,000 people work at Willis Tower each day, not counting the thousands of building and Skydeck visitors. 12 million people pass by and through Willis Tower each year. Willis Tower contains approximately 4.56 million gross square feet which would cover 105 acres if spread across one level, the equivalent of 16 city blocks in Chicago or 101 football fields. Willis Tower has a rentable area of 3.8 million square feet. Each floor of the building is divided into 75-foot column free squares, or “mega-modules” which provide maximum planning, flexibility and efficiency. Some of the finest materials like travertine, stainless steel, granite and other decorative features are used throughout the buildings common areas to highlight the property’s prestige. In 2017, 125,000 square feet of new amenity space including ‘Tower House’ and ‘Altitude’, were built exclusively for Willis Tower tenants. Tower House is located on the 33rd and 34th floors featuring a bar, café, conference center and 30,000 square foot fitness center called TONE. Altitude is located on the 66th and 67th floors featuring a café, relaxing lounge seating, informal meeting spaces, and breathtaking views of Chicago’s lakefront. In early 2017 Blackstone and EQ Office announced plans for the biggest restorative transformation project in the building’s history. Blackstone has invested more than $500 million to redevelop this American icon. The redevelopment consists of more than 300,000 square feet of new retail, dining and entertainment space at the base of the tower, 150,000 square feet of new tenant amenity spaces, and a 30,000 square-foot outdoor deck and garden. Gensler is the architectural partner of record for the Willis Tower redevelopment. SkB Architects is leading the design effort for the street level experience and façade of Willis Tower’s new base. From street to sky the building will provide inviting hospitality and memorable experiences on a scale unmatched by any other destination. The mission of the redevelopment is to create an all-season, urban destination that brings the surrounding community together and creates a true neighborhood that is the heart of downtown Chicago. The building’s new exterior is designed to be warm, inviting and approachable, extending the streetscape to create a sense of community and immerse workers and visitors in true Chicago. 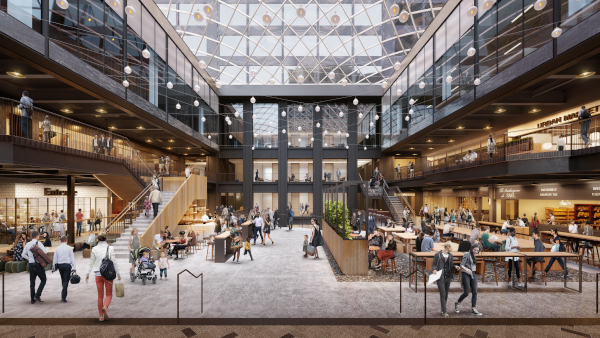 The new Willis Tower will dissolve the borders between work and life and fostering a collaborative, inviting atmosphere. Willis Tower’s Wacker lobby is being remade from the ground up to be more open and inviting. It will feature expansive lounges, a bar and patio. The Wacker Drive lobby, now under construction, is scheduled to reopen in 2019. At the ground level on Jackson Boulevard will be Catalog, a 300,000 square foot space featuring 5 levels of new retail, dining, entertainment and a revamped Skydeck experience. At Willis Tower, we are continuously expanding our eco-conscious efforts and investigating harnessing solar energy, constructing additional green roof space, and more. Believe sustainability matters? We do, too. We have already cut the building’s original energy consumption by a third. Who knew that the true color of the Willis Tower was green? The Willis Tower is not only an innovator in promoting green practices among its tenants, but also stands as a leader among American skyscrapers in increasing energy and water efficiency and reducing waste. Over the past 20 years, the Tower has reduced annual electricity consumption by 34% by installing enhanced lighting systems and controls and adopting special conservation practices. The building saves 10 million gallons of water each year, or the equivalent of 156,448 full bathtubs, by relying on reduced water-flow fixtures. These innovations are spurring the building to look into certification as a LEED (Leader in Energy and Environmental Design) certified building and explore renewable energy resources, such as solar and wind power and even “green roofs” covered with vegetation. Can you imagine a thriving garden high in the sky? Reduced annual electricity consumption by 34 percent in the last 20 years. As part of the building's recycling program, tenants recently recycled over 2,103 tons of paper, aluminum, glass, & plastic and construction waste annually. Saving more than 10 million gallons of water annually, the equivalent of 156,448 bathtubs. Recycled more than 16 tons of electronics over one year. Implemented tenant bike riding programs that provide indoor bicycle parking, showers, changing rooms, complimentary loaner bikes, helmets and locks. Offered parking discount incentives to tenants driving hybrid vehicles. Reduced water consumption by installing low-flow fixtures. Initiated a window replacement program to improve insulation. Improved energy efficiency through enhanced lighting systems and ontrols, higher efficiency motors and management practices. Implemented green cleaning and maintenance programs that reduce the use of harmful chemicals. Willis Tower has also has earned the U.S. Environmental Protection Agency’s (EPA’s) ENERGY STAR certification, which signifies that the building performs in the top 25 percent of similar facilities nationwide for energy efficiency and meets strict energy efficiency performance levels set by the EPA. 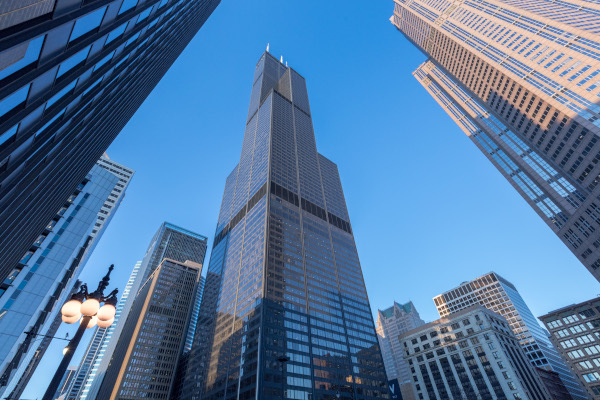 The Willis Tower will be the largest office building ever to receive ENERGY STAR certification, and the third-largest building overall. There is a lot of great stuff for kids to see and do. Follow the links below to explore the various activities offered on the site for kids. Don’t forget to download them all before you come on your visit! 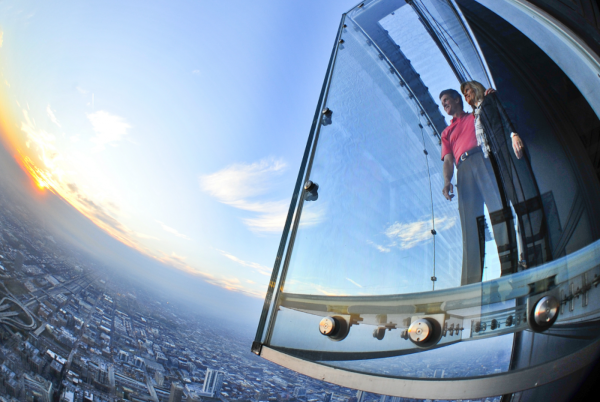 Skydeck Chicago’s Teacher’s Guide has 37 pages of facts and fun. Take a look! Printable fun fact sheet, quizzes, coloring pages and even a scavenger hunt for your visit are only a click away.